Chalkboard is very hot right now in graphic design. Once you look for it you will see it everywhere. This look can be easily created with paper and ink. Earlier this year my upline, Brian King, showed how to create some great cards that contain chalkboard elements. You can see that blog post here. Recently I saw a cute chalkboard Christmas sign and decided to do something similar for my Christmas card. Last year I made my cards with Stampin' Up's My Digital Studio (MDS) and was very pleased with the results so it seemed like a great way to do my cards again this year. With MDS I had all the "supplies" I needed, literally at my fingertips and I was able to create my card in a few hours! Plus once I had it created there was no craft area to clean and I could print as many copies as I needed, either through Stampin' Up's Print Services or on my own printer! If you have not considered using MDS in your papercrafting you should! Yes there is some learning involved but you can download a free trial if you want to test it out and Stampin' Up has produced almost 100 short instructional videos, each focusing on one small aspect of MDS. You can click on the My Digital Studio tab above to see these videos. If you think you might be interested I would encourage you to look at the Getting Started with a Card video first. I think this video will give you the best introduction to MDS whether or not you are a card maker. After that you can check out MDS Overview and Getting to Know MDS. A detailed list of FAQs will give you lots of good information. Stampin' Up! has tons of digital downloads and introduces new ones each week (see the link on the right side on this page for the most recent downloads) plus MDS comes with plenty of content to make lots of great projects right from the start. A chalkboard look can be created in MDS simply using Basic Gray digital cardstock and white digital ink but digital chalkboard is also available from a number of places. Stampin' Up! has a chalkboard background in three of its digital download kits (Convention 2012 Photobook Template; Back to School and Hello World). You can purchase one of these kits and use the chalkboard that is part of the kit or if you know how, digital chalkboard can easily be made in Photoshop or similar software and saved as a JPG. Once you have it as a JPG you can use it in MDS, just like any other element. That is how my chalkboard element was made. 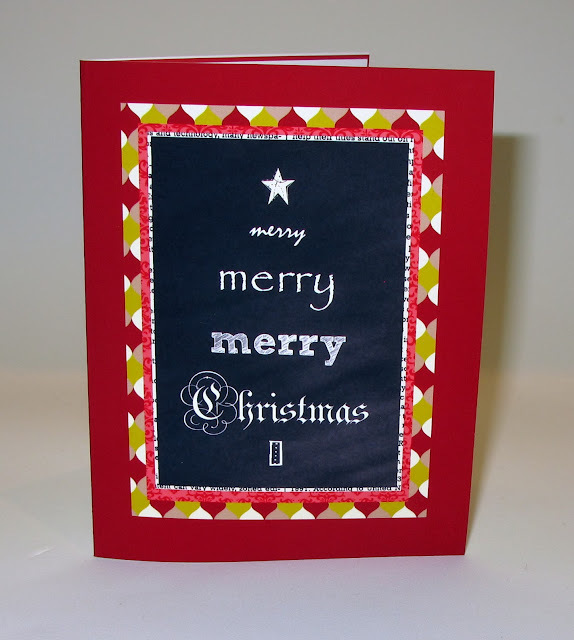 I then cropped a piece to the size I wanted and created text boxes with the words merry and Christmas in white "ink". Some of the fonts I used appeared chalk-like from the start. For the others, MDS allows you to easily reduce the opacity of the "ink" creating more of a chalk look. For text MDS uses the fonts already on your computer. If you want more there are tons of additional free fonts available on the Internet for download. I then added a star and a tree trunk from two stamp brush sets (as they are called in MDS) that came with the software. I placed my finished chalkboard on a digital Cherry Cobbler background and added digital DSP. If you would like to try experimenting with digital chalkboard I will be glad to email you a copy of the JPG I used. Just email your request to cottagepapper@bellsouth.net. Great project, Katie! Love that it's form is a tree. Merry Christmas to you and your family! I hope it's wonderful! More Great Buys from Stampin' Up!